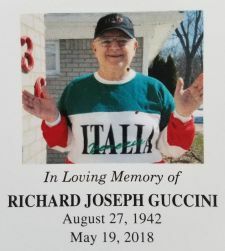 This page is dedicated to Richard Guccini. 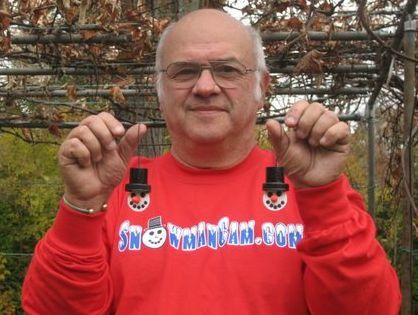 The Snowman Cam would not have been possible without his love, dedication and support for many years. 5-26-18 Update: WaterPaw www.waterpaw.net is coming out next Thursday to do a site survey and give us options and pricing. 5-31-18 WaterPaw had to reschedule to Saturday, June 2nd at 4:30. 5-31-18 Almost $5000 has been raised so far. Thank you! 6-1-18 Over $5000 has been raised for Richard's Pond! 6-2-18 Received an estimate of $15-18,000 from www.waterpaw.net to build a bear resistant wildlife pond. 6-4-18 Total raised to date is $5710. 6-5-18 Total raised to date is $6110. 6-6-18 Total raised to date $6245. 6-7-18 Total raised to date $6835. 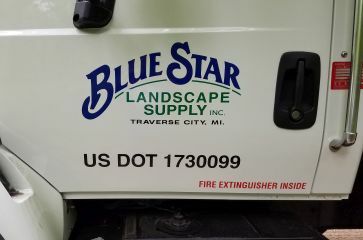 6-8-18 www.bluestarlandscapesupply.com is the company where we are getting the granite boulders. 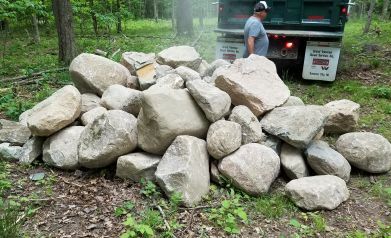 They just offered to deliver the boulders for free. Can you help up fill the truck? They can haul 13 tons at a time. We have 6 tons ordered so far. 6-8-18 Total raised to date $7110. 6-11-18 Total raised to date $7635. We are getting close to the halfway mark! 6-12-18 Total raised to date $8820. We are just over half way there! The truck is full for this Friday. We will need about another half a truckload to complete the pond. Thank you for all of your generous donations. 6-15-18 Total raised to date $10,680. The truck with 13 tons of boulders will be delivered today. 6-25-18 Total raised to date $11,255. We still need another half truckload of boulders to complete the pond. 6-27-18 Total raised to date $11, 505. MissDig came out today to mark the underground wires. We found out the electric service runs right through the center of where the pond will be. We will be getting an estimate for the cost to move the wires. 6-30-18 After checking with the power company, it will be less expensive to move the pond slightly back. The view of the pond will still be good. 7-1-18 Waterpaw was able to get substantial discounts from their supplier www.aquascapeinc.com for Richard's Pond. Thank you to Waterpaw and Aquascape for helping us make Richard's dream a reality. 7-4-18 Happy Independence Day! The total raised so far is $11,625. We are getting very close to having the funds we need. 7-7-18 $11,700 raised so far. Be sure to like Waterpaw on Facebook to follow the progress. 7-11-18 $11,755 raised so far. Brenda and I will match all donations from now until August 1st. Please help if you can. 7-18-18 $12,845 raised so far. We are only $2155 away from having all the funds needed to complete the pond. 7-19-18 Total raised to date is $14,075. We are almost there! Will you help put us over the top? 7-21-18 Total raised to date is $14,221. We are only $779 away from hitting our need! Can you help us reach the finish line? 7-22-18 Total raised to date is $14,401. Only $599 needed to pay for the pond! 7-23-18 Total raised to date is $14,561. Only $439 to go. Can you put us over the top? 7-25-18 Total raised to date is $15,695! Thanks to many gererous folks from around the world we have hit our goal! Words alone cannot express our gratitiude and appreciation for each and every one of you. You have all made Richard's dream a reality. The construction will begin August 7th and is expected to take three days to complete. Any additional funds raised for this project will help with the cost of maintenance, lighting, benches, memorial marker, landscaping, flagpole and misc. 7-26-18 Total raised to date is $16,245. The additional amount will really help with misc expenses. Thank you! Patty Majzoub - Joplin MO. Damien and Julie Crane - Alton, U.K.
Carole Pickering - Hertfordshire, UK. Robert and Catherine Waple North Lanarkshire, U.K.
Stephanie Vittoria - Washington, D.C.
Vivienne Francis - Northhamptonshire, U.K.
Eddie & Ellie Cragg - Thurso, U.K.
Michael Dearden - Cheshire, U.K.
Mike and Mags Hardy - Castleford, U.K. Operated the store. Handled everything. Designing, ordering, building, storing, shipping, customer service...everything. 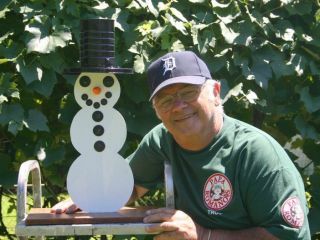 Built the Snowman that you see on the cam today. 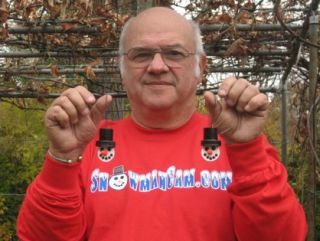 Also built two additional snowmen as spares. Richard was Santa Claus at Christmas time and talked with the children in the Snowman Cam voice chat. Moterated the chatroom. Made sure the chat was alway family friendly. Dealt firmly and fairly with people when needed. Started triva on Friday nights, then added Sunday afternoons so our friends across the pond and in different time zones could play. Helped build the pond on the other side of the house. Came every year to help clean it. Always wanted to move it to in front of the cam. Created the bear contest so people could guess when the first bear of the season would arrive every year. Awarded prizes. Put together a calendar every year as a fundraiser for wildlife food to help get them through the winter. Was always coming up with ideas to help raise money to purchase food for the wildlife and help with the expenses of the site and cam. Called Ken almost everyday and sometimes many times per day to discuss ideas to make the site more enjoyable for people. Built and shipped the little model Woodys and bears to help fund the site. Created and shipped the Christmas cards showing the four seasons of the cam. 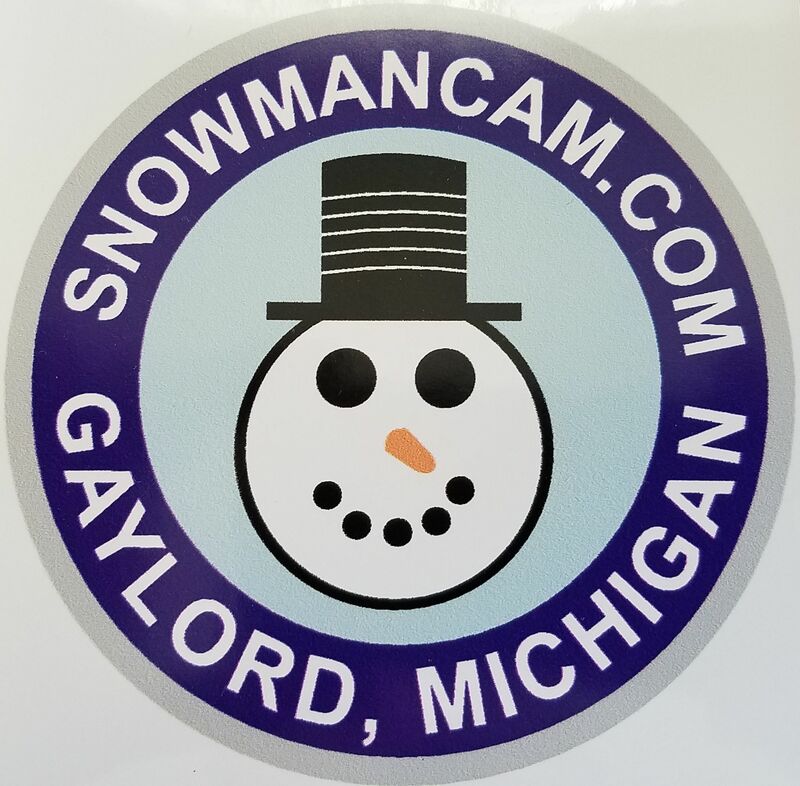 Was a constant cheerleader and promoter of the Snowman Cam wherever he traveled. 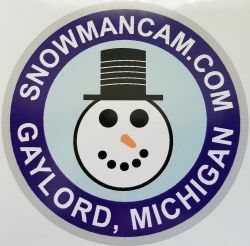 These are only some of the things Richard did to make the Snowman Cam such an enjoyable and family friendly community. Richard is dearly missed by those who knew him or were touched by him. Rest in peace our dear friend. We will build your pond.